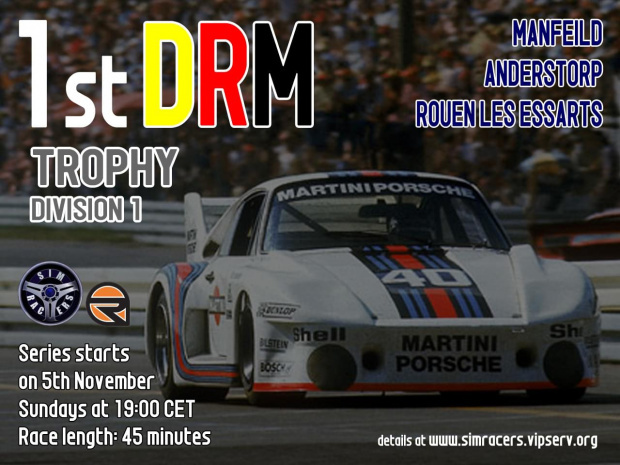 1st DRM Trophy starts on 5th Noveber 2017 including 3 races. Scoring: Top10 drivers: 15-12-10-8-6-5-4-3-2-1. Points are counted with at least 50% race distance covered. Car choice: ONE CAR DURING ENTIRE SEASON - free choice from Division 1 cars - "first come first served" rule. Cars availability restricted by mod - player should own one car with one team during the season. Player can change the car in the mid season, but all collected points are zeroed. 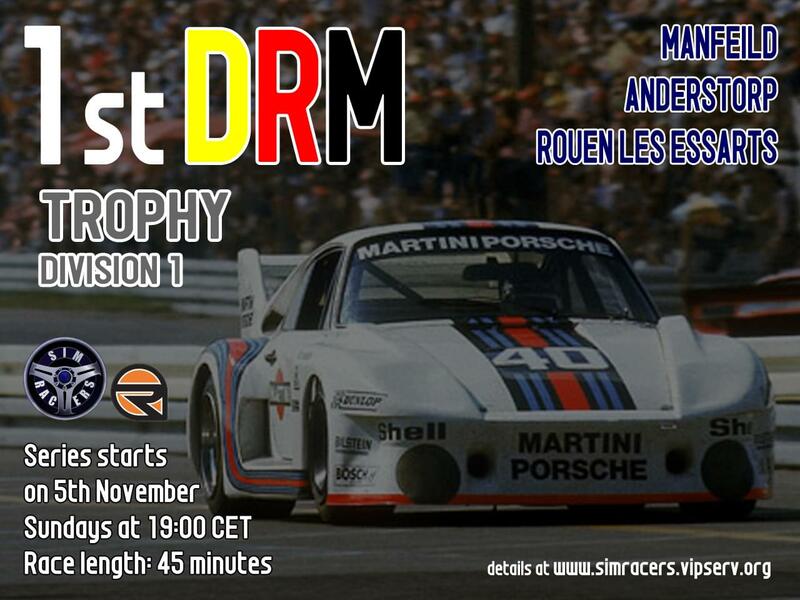 Events begin at 19:00 CET (18:00 GMT) with Qualifying. 1. Play fair and don't ruin somebody's game. 2. While overlapped, move over by clear manoeuver and slowing down on straight or by turning wide into the corner. Don't race with faster drivers in case of being backmarker. 3. Remember, first 1-2 laps tires and brakes and cold. Be careful on first corner especially. 5. In case of taking wrong car in a race (according to car selection system) player will be disqualified. REGISTRATION STARTS FROM NOW !!! In case of any questions please write in this thread. It looks complicated but it's simple. Last Edit: 1 year 4 months ago by Admin. Last Edit: 1 year 5 months ago by Mikko Nieminen. Last Edit: 1 year 5 months ago by Nuno Gaiteira. Nuno, great. Take your team please finally.